City Construction does more than manage projects. 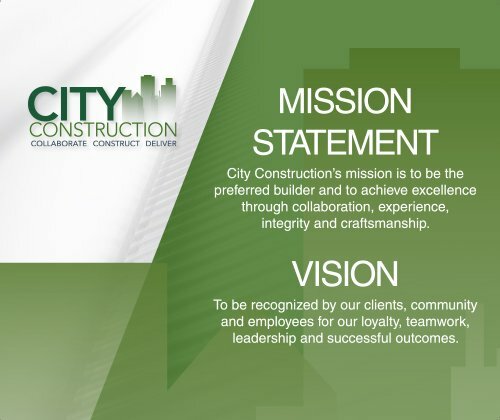 The team at City works with developers, architects, financial stakeholders, owners and contractors to bring each entity to the project early to share knowledge that can create cost and time efficiencies. This collaboration gives owners more control, which leads to greater satisfaction for healthcare, education and municipal clients who select City again after an initial successful project outcome. City Construction is local. We’re your neighbors with a vested interest in making a difference in our shared community. Our work reflects our commitment to make our hometowns vibrant. We are active members of economic development organizations in eastern Iowa, including the Iowa City Area Economic Development Group, and play a role in creating a more prosperous region. We also champion causes like the American Heart Association to support individuals and families in the Iowa City-Cedar Rapids Corridor and nearby communities. We are proud to bring recognition to our community through awards from the Master Builders of Iowa and the American Institute of Architects, Iowa Chapter. City Construction has performed several projects with me at University of Iowa Hospitals & Clinics as the general contractor. I have found the team very knowledgeable in construction practices, and they have proved invaluable in providing key engineering input to capital management and users. Their projects are always of the highest quality.